When the weather forecast calls for a wet rainy weekend, that could be the very best time to visit the Great Smoky Mountains of North Carolina …especially if you love waterfalls. It’s when the creeks and rivers are in their finest whitewater form. Indian Creek Falls is always beautiful. But it has never looked better than in the above photo, which was shot a few hours after a heavy Spring rain swept through the Park. 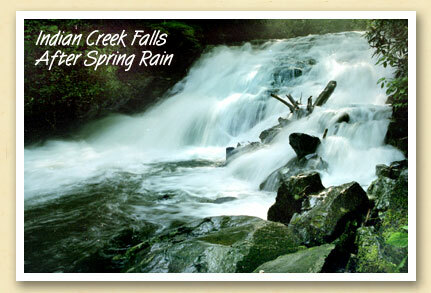 Indian Creek is one of three scenic waterfalls in the Deep Creek Area of the National Park two miles north of Bryson City. All are within a mile of the trail head parking lot. You’ll find information on these and other waterfalls in the Bryson City area on the Waterfalls page of the Bryson City Smoky Mountain Vacation Guide web site.